Chronicle Books' "This Book is a Planetarium" is a lot of things. In fact, six different things, all wrapped up into one pop up book for children and design-loving adults to enjoy and interact with. The author, Kelli Anderson, notes that all six demonstrations, carefully crafted of paper, show the work of science, with "Why it Works" sidebars discussing the background of each. The simplest is a two-sided insert with a decoder ring and a perpetual calendar sharing one pop up. Sounds are the focus of two pop ups, including a "speaker" that amplifies a cellphone's music, and a five string musical instrument. Clever demonstrations and designs, although I'll note that the tension on the strings is a bit too loose to provide a good enough sound to completely pull off the concept. The cone does, in fact, amplify the sound, but it's probably a stretch to call it a "speaker" in any technical sense. The pop up holds the cellphone at the cone, which amplifies the sound level of the playing music. I was excited to see the inclusion of the spiralgraph, a paper version of the Spirograph toy many of us loved as kids. Sadly, I found it very difficult to keep the gears in the proper positions while drawing. 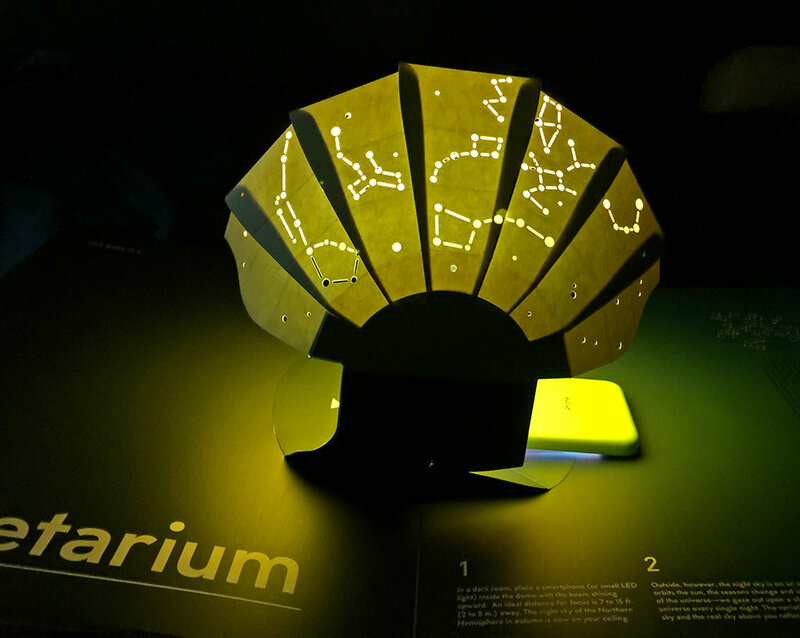 The title piece, the planetarium, is the highlight of the book, and works surprisingly well, using the light of a cellphone's "flashlight" app. Impressive design and concept, pulled off. A lot of fun. "This Book is a Planetarium"